Need some tips on how to wash stuffed animals? Those beloved treasures can be a trickier item to launder. Can they go in the washer or not? Can you use regular detergent or do you have to use a specialty product? Is my little one going to have a melt-down if I take the stuffed animal away long enough to wash it? Hint: don’t wash those kinds of stuffed animals around nap time or bed time. Trust me. There are many reasons you need to wash stuffed animals: the attack of the stomach bug, they can be dusty from sitting on a shelf, a little too much love from the owner, lice or other varmints, or frequent washing for kiddos with allergies and asthma. Stuffed animals are like clothes – the less you wash them, the longer they will look new. After an animal has been washed that crisp, new look probably won’t be there. But at least they’ll look clean! – Have items glued on – sequins, etc. Glued-on eyes probably will survive a washing. – Are filled with small foam balls inside (like Beanie Babies) and not batting. Before washing a stuffed animal, examine it carefully. Are there parts that need to be removed first? Any strings that need to be secured? Stuffed animals are similar to pillows in that they wash much better if laundered in a machine that does not have an agitator. If you have a top loader, you could always take a large load and wash them at the laundromat. Washing with an agitator tends to make the animal ball up due to the agitator displacing the batting. 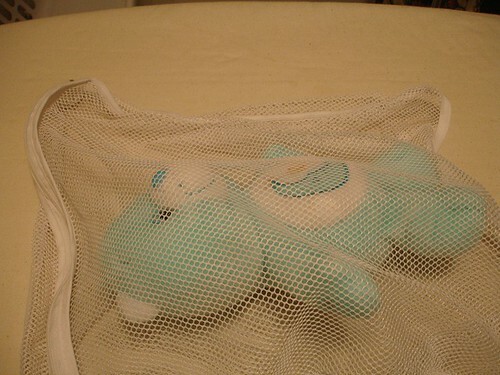 After determining your stuffed animal can be washed, place it in a mesh laundry bag. The mesh bag gives it an extra level of protection from snagging or being pummeled too much in the machine. Always wash stuffed animals on the gentle/delicate cycle. They just can’t tolerate a more aggressive washing that a ‘normal’ cycle would give. You can use a warm or cool wash but steer clear of hot. If items are glued on, the hot water might dissolve some of the glue. After washing, remove from the bag and hang dry. I hang mine using a child’s clamp hanger or on my S-hooks. I’ve ordered these S-hook-type clips, and I’m pretty sure I’m going to love them! They get great reviews. Dryer heat – even on low – could potentially melt glued on or plastic parts. – Make sure the stuffed animal can be washed. – Place in a mesh bag. – Wash on warm/cool water temperature on the delicate cycle. – Hang dry. Don’t put in the dryer. I have this medium sized beanie baby that also has stuffing in it, I’ve had it since the 3rd grade and I’m in my early 20s now so this stuff animal is pretty old now. I don’t want to ruin it if I wash it I’m planning to give it to my son when he’s born. I don’t know if you’ll still be on and stuff to answer my question, but I have a tsum tsum of Rocket raccoon, he is full of stuffing but also the ball things, but his eyes used to be white and they’re dirtier now and it’s stressing me out, is there a way to make it clean looking again without ruining him? Hmm. I’m not familiar with that stuffed animal, but if it has the little balls/pellets inside, I’d be careful with cleaning him. Without knowing exactly what the eyes are like (fabric? plastic?) I’d try using either diluted Tide or Dawn on a toothbrush and gently rubbing them to see if that would help. Then air dry and assess results. If they’re still not what you want, try again with the diluted Tide or Dawn. I’d spot clean him only. His plastic head will never look the same after going through a machine, and it would destroy the cardboard feet. So spot cleaning with a little bit of Tide or Dawn on a toothbrush is the way to go. Carmen, if it’s old and precious to you, I would definitely use my guidelines for hand washing it! 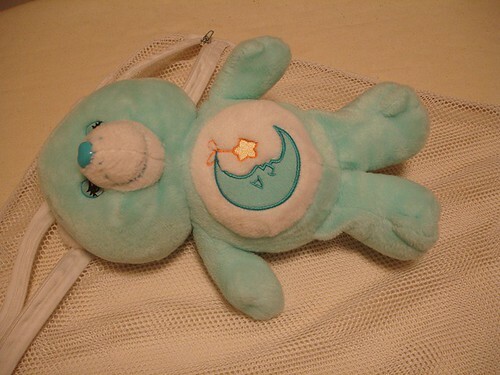 Old stuffed animals are usually too fragile and delicate to go through the machine. 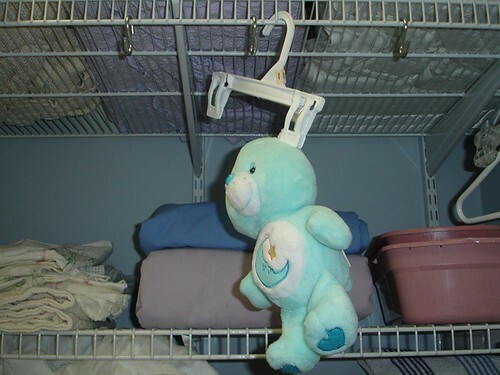 If I put it in a pillowcase, is it okay to wash a stuffed animal in a top loading washing machine? A mouse got into my apartment and thankfully it’s back outside. But, there was a stuffed animal in the floor and I’m afraid the mouse found it. I don’t want to just hand wash it because I want to use Lysol laundry sanitizer. I hate to throw it out because it was a gift. What do you think? I can relate to your mouse dilemma and wanting the stuffed animal to be clean again! Now a top-loader probably has an agitator and that will definitely put wear and tear on the item, so just know that before you wash. But I agree with you 100% – I’d rather it go through the machine to drench it in water and wash it well and have the peace of mind that it’s clean. But it WILL probably change the look and feel of it. Just be forewarned. when I read through this article about cleaning you stuffed animals or “Plushies” as my children whose ages rages from 9-13 as well as my smartsy fartsy neice (lol, shes so adorable and loves being around her cousins) call them. Anyway, I too would not want anyone touching our toys after knowing or witnessing a mouse on or around them either. Like most people, I also have a top loader washing machine but if I dont want to ruin their stuffies I would 100% take them to a laundromat and use the washing machines that are opposite of a top loader or a machine without the agitator. Thank you for all the great advice and sharing the techniques on how to clean the different types of stuffed toys that are out there.